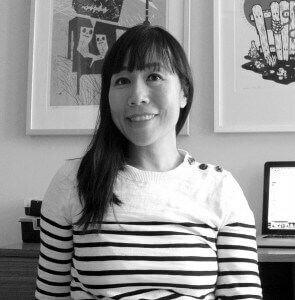 All of us at This Magazine would like to say a happy hello to our new art director, Valerie Thai. Valerie specializes in print design and illustration for socially conscious and sustainable companies. She was also the award-winning head designer and art director of Adbusters for five years running. We’re thrilled to have her on board! To get to know Valerie better and to introduce her to our readers, we recently sat down with her and played six questions (that’s a thing, right?). Tell us more about how you first discovered This Magazine. It was one of the many Canadian titles in the magazine library at the last publication where I worked at (Adbusters). It was great being exposed to different publications from across the country. Where do you get your design inspiration? My inspiration seems to come from all over—art, music, my environment and daily life. What’s the coolest design or art project you’ve ever worked on? A skateboard deck design I collaborated on for the We Are Contributors skateboard fundraiser. It was a one-off design that we illustrated and then wood-burned by hand into the deck. If you could see any one work of art in real life, what would it be? Hard choice. Automatically, I am eliminating works that I can technically hop on a plane and go see. So, I wish I had seen Banksy’s Dismaland. It was only a temporary exhibit in England that took place last summer, but the sheer spectacle and scale of it all looked amazing. Most of Team This runs on coffee fumes. What about you? What’s your stay-awake strategy? Yes, coffee for sure, with lots of sugar and cream. Music helps as well. Oh, and snacks (white cheddar popcorn makes an appearance often). Favourite Canadian icon? Design: Bruce Mau. Activism: David Suzuki. Childhood: Mr. Dressup.